A couple of weeks ago, for Hispanic Heritage Month, Master Communications released another set of videos in their Worlds Together DVD series. Three of those DVDs feature Latin American countries: Worlds Together Cuba: Pearl of the Antilles, Ecuador, and Colombia. The 25-minute videos delves into the culture and traditions of each country. You can choose to listen to the video in English or Spanish - or read subtitles in either language. While the Cuba video does not delve into the controversial political history of the country, it does talk about the economy, music, food, religion, wildlife, and cultural traditions. Lots of footage of the people and places accompany the narration. It also touches on the island's history. 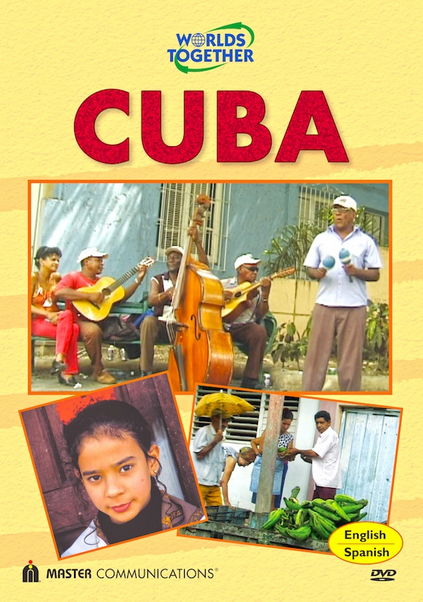 It is a nice introduction to Cuba for children without the heavy issues that go with it. I had my kids watch it as part of our Hispanic Heritage Month studies. They enjoyed seeing the footage from another country and loved learning more about its people, language, and culture. The trailer for the video on YouTube is pretty cute, but a little misleading as the video I watched was narrated by a woman who simply acted as a voiceover. There were no children talking about the country. Other titles in the series include Tibet, East Africa, West Africa, and Ethiopia. You can find the whole series for sale on the Culture for Kids website. But I would recommend simply streaming it from Amazon Instant Video for only $1.99.